This one will make your head spin, especially the statutory construction part. The case is Encylopaedia Britannica, Inc. v. Dickstein Shapiro LLP (D. D.C. Aug. 26, 2015). The Dickstein Shapiro firm was retained by Encyclopaedia Britannica, Inc. (EB) in 1993 to file a patent application. The patent issued, and in 2006 EB sued several companies for infringing it. The patent was held invalid due to “an unnoticed defect” in the 1993 application. The basis for invalidity was not 101, however. After the malpractice suit was filed, Alice was decided. The firm then argued that, as a result, the claims were ineligible and so any malpractice by it in 1993 could not have been the but-for cause of harm. The claims would have been “invalid” under 101 even had it not botched the 1993 application, and so there was no harm caused by any error it made. To put this in context: Because of a 2014 Supreme Court decision, the 2006 case would have been lost anyway because, in 1993, the claims were not eligible for patenting. And the argument worked. The district court granted a motion to dismiss for failure to state a claim, finding the subject matter ineligible on the face of the patent. I’ll leave the merits of that to others. For this and other reasons, the court reasoned that “the only rule that makes sense in this context is to apply the objectively correct legal standard as enunciated by the Supreme Court in Alice, rather than an incorrect legal standard that the [district court in the 2006 infringement case] may have applied prior to July 2015 [when the court was deciding the motion. ]” The court then applied Alice and found the claims “invalid” under 101. Second, there could be enormous consequences if Alice changed the Court’s prior interpretations of 101. While as a matter of statutory construction the retroactivity principle relied upon by the district court is correct, retroactivity does not ordinarily apply when an interpretation is changed. (This perhaps explains why the Supreme Court is careful to avoid saying it is changing an interpretation, because changes to interpretations of a statute are prospective, only, as a general rule. In that regard, think about Therasense for a moment.) So, if Alice changed the law, then the district court was likely wrong to apply it retroactively. More broadly, however, if Alice (and the rest) changed the meaning of 101, then it means many patents now being held “invalid” should not be judged under Alice. I’ve been waiting for someone to make the retroactivity argument (as with Therasense, which clearly changed the CAFC’s interpretation of “unenforceability”). It would be fun to try to see someone use Alice and apply it to the Supreme Court line of cases and make them all fall in a line. Is that really true? There’s nearly 700 district judges in the country. If we had a statistic about the average number of patent cases that a district judge hears and receives on, let’s say, a 5 ­year period, what would it be? Oral Argument Transcript at 14 (full transcript available here). The question was posed in such a way as to imply that patent cases were a rare occurrence for most district court judges, and since neither counsel nor research into secondary sources provided a ready answer, we pulled data from Lex Machina to seek some insight into this issue. Since we were interested in frequency, we looked at the number of patent cases filed between 2010 and 2013 on a per judge basis. Our analysis shows that while patent cases are relatively common generally, their distribution is indeed highly skewed. Nevertheless, most active judges heard at least one patent case during the time and the median number of patent cases received per judge was higher than one might expect (it’s eight). The below chart illustrates the number of patents cases received by each judge who was active during the 4-year time period, sorted by the number of patent cases received (i.e. : the judges who heard no patent cases are to the left and the judges who heard the most patent cases are to the right, with Judge Gilstrap being judge #760). The chart cuts off at 100 cases received, but the line continues up with seven judges receiving more than 600 patent cases each (Judges Robinson, Sleet, Andrews, Schneider, Stark, Davis, and Gilstrap). Methodology: To obtain the data set, we ran a search on Lex Machina for all patent cases filed between 2010 and 2013. We then copied the judge data from Lex Machina’s dynamic filter, giving us the number of patent cases per judge. We obtained data on all district court judges (not just those that appeared in the Lex Machina search results) from the Federal Judicial Center. This allowed us to filter the results to include only judges that met our criteria of “active” judges for the time period (i.e. : judges that were confirmed to a district court prior to 12/31/2013 and had not retired or been terminated until after 1/1/2010). There were a total of 760 active district court judges between 2010 and 2013, although some were active for only a short time during the window we analyzed. We were also able to limit our data set to only judges who were active for the entire time period (i.e. : who were confirmed to a district court prior to 1/1/2010 and who did not retire or take senior status prior to 12/31/2013); a chart using this data is below. Background Statistics: In total there were 19,325 patent cases filed before 865 judges over the four year period. The judge with the most patent cases was Judge Gilstrap of the Eastern District of Texas, who received 1,636 patent cases. Although several judges received an extraordinary number of cases, many judges that heard patent cases had only 1 patent case filed before them during the 4 year window we examined. Of the 19,325 total cases heard in District Courts, 18,061 cases were heard by 760 active judges. The remaining 1264 cases were heard by 165 judges that were primarily senior status, although there were several appellate judges sitting by designation. For this analysis, we did not include any cases filed before judges that were not active during at least some portion of the period. There is one important caveat to this data: it reflects patent cases received by the judges. As a result, it does not directly report on the number of patent cases actually heard by district judges (since sometimes case settle soon after filing), nor does it directly report perhaps an even more important statistic relating to Justice Alito’s questioning, that of judges’ experience rendering substantive decisions in patent cases. 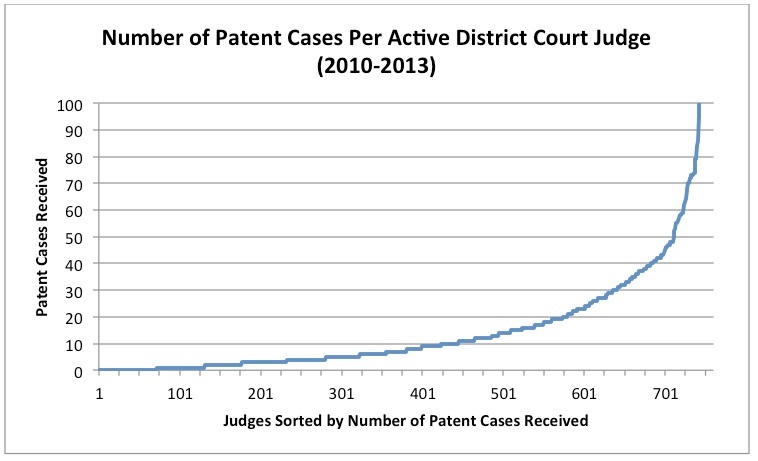 This data does, however, provide some insight into these issues because we know that both figures cannot be greater than the number of patent cases received and (unless there is a particular selection bias operating in certain districts that affects settlement rates), it seems likely that the distribution of both patent cases heard and decided would follow a similar pattern. Analysis: The average number of cases received by active judges was 23.8 cases over the span of four years, or almost 6 cases per year, while the median was 8 cases over the four-year span. While the highest districts in terms of filings did affect the mean, removing the three highest (the Eastern District of Texas, Central District of California, and District of Delaware) still resulted in an average of 13.3 cases per judge. Of the active judges, there were 71 that did not receive any patent cases within the window. 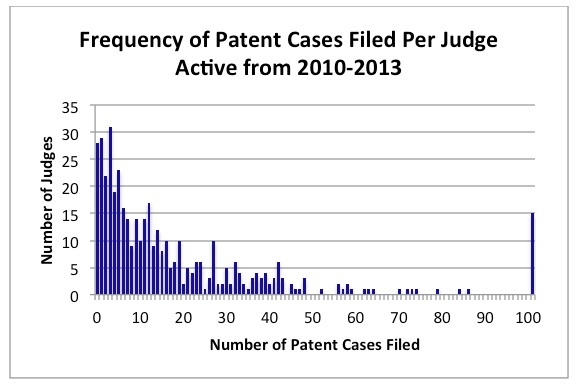 Thus over 90% of active judges received at least 1 patent case filed during the window. Additionally, we looked at the numbers for judges that were active throughout the 4 year time period, in order to get a sense of what an average “active” judge might see. These judges were commissioned prior to 1/1/2010 and had not been terminated or retired prior to 12/31/2013 (thus excluding both judges who were on the bench for only a part of the period and judges who took senior status during a portion of the period). For this set, there were a total of 11,096 patent cases received by 434 judges. The average number of cases received was 25.6 with a median of 11 cases over the four-year period. Removing the top three districts from this data set still produced an average of 20 cases and a median of 10 cases received over the four-year period. In total, only 28 of the 434 active judges did not receive a patent case during this time; over 93% of judges received at least 1 patent case. The graph below shows a frequency chart of only judges that were active during all 4 years (the bar on the far right reflects the fifteen judges who received over 100 patent cases during the four-year period). *Joshua Haugo is a second-year law student at the University of Iowa College of Law. Edit: Michael Risch pointed out that there may be an effect depending on how Lex Machina counts transferred cases, which he estimates at 15-20% of cases. I’m looking into the way that Lex Machina counts these types of cases: its database certainly includes both the transferor and transferee dockets, but it does not appear to count the transferor judge as being the “judge” of the case. Instead, it appears to only count the transferee judge. I’ll update the post once I have a better sense of this effect. Edit2: Based on further investigations (and subject to confirmation from the folks at Lex Machina), Lex Machina counts both the transferring court and the transferee court; in other words, its not deduplicating. The effect of this is to artificially inflate, perhaps by as much as 15-20%, the case counts below. This causes me to echo the caution I noted originally: just because a judge “received” a case does not mean that he or she “heard” it, let alone on the substantive merits. Edit3: Lex Machina confirmed that “each separately assigned civil action number is a case except, if it is an intradistrict transfer, we detag it so it does not count as a patent case. In the event of a inter-district transfer, we will have one case with the outcome “procedural: interdistrict transfer” and the other case with whatever its outcome was.” So what I observed above holds.